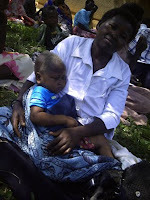 The Spring of Hope team arrived Wabukwa, and there were many women and children waiting for us. We brought along along two professionals that had an expertise in Epilepsy. The morning was spent educating the people on what exactly epilepsy is, what causes it, what can be the effects of it, and how to treat someone with it. This session appeared very informative to the people that came. There seems to be a stigma around Epilepsy in the villages. People will take their children with epilepsy to Witch Doctors to heal them. They also think that some sort of witch craft or worms in the brain are causing them to have seizures. I think that increasing awareness of Epilepsy and education is such an important thing for these people, and I know it will spread by word of mouth, especially because the number of cases of epilepsy appear to be quite high. Epilepsy can actually be caused by Malaria, which is why there are many cases. Children can function quite well with this, but do need medication. Spring of Hope has started providing people with this medication in the villages. Over 76 children were treated and seen for epilepsy medication at the outreach clinic in Wabukwa that day. Instead of giving the medication for free, parents were asked to pay very little money (1000 USH) for the medications. It is important to teach the parents to take responsibility for their children's health. During the clinic, children were also seen for malnutrition and developmental disabilities. The children who are malnourished are quite easy to point out because their hair starts to turn yellow. Some parents had concerns about feeding their children. The occupational therapists assisted them with showing the parents different positions that may help with feeding. Parents were given strategies on positioning their child to prevent and/or decrease the occurrence of bedsores (pressure ulcers). The occupational therapists also provided parents with various stretching and exercises to help with physical development (i.e. head control). All in all, it was a very successful clinic in Wabukwa. Children were treated, parents were educated, and more needs are being met in the villages. It was eye opening for me (Kristin, the occupational therapist from the U.S.A) because it was my first clinic and first week here in Uganda. The resources they have in their homes are sooo limited and there is little awareness and acceptance of children with disabilities. It is very easy to be saddened by these cases, but I am impressed in SOH's ability to stay strong and make some changes. I do think that Spring of Hope has been doing good work in increasing awareness and changing the attitudes of people. I am definitely encouraged, and the glory is to God!